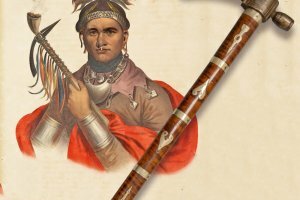 In 1792, a beautiful pipe tomahawk was gifted to the great Seneca leader Cornplanter by George Washington. It was sold in 1850 by its then owner Ely Parker, a Seneca sachem, as well as an attorney and engineer who later joined U.S. Grant’s staff as an aide-de-camp during the Civil War. The pipe tomahawk’s purchase was made by Parker’s friend Louis Henry Morgan, an Iroquois scholar and pioneer anthropologist. The historically important artifact then became part of the New York State Museum’s collections for nearly a century before it was stolen sometime between 1947 and 1950. Join us at Grant Cottage to learn the history of Cornplanter’s pipe tomahawk, its disappearance and its miraculous recovery in 2018. Our program presenter will be Dr. Gwendolyn Saul, Curator of Ethnography at the New York State Museum. Admission: The suggested donation for Grant Cottage Programs is $5 per person.